William R. McGee chosen as Plaintiff’s attorney guest speaker at prestigious Motor Press Guild presentation. Tuesday, May 6, 2008. This month’s meeting went outside the usual guidelines of MPG luncheons. Organized and moderated by our own Don Fuller, who is an expert witness at Lemon Law trials, the presentation was by two highly accredited Lemon Law attorneys: for the plaintiff, William McGee, and for the defense, Brian Takahashi. These men, key players in courtroom battles between unhappy vehicle owners and manufacturers, squared off and explained what Lemon Law is, how it works and what it all means. MPG luncheon guests got to be the jury and make their own decisions. Special thanks to Don Fuller for organizing this luncheon. 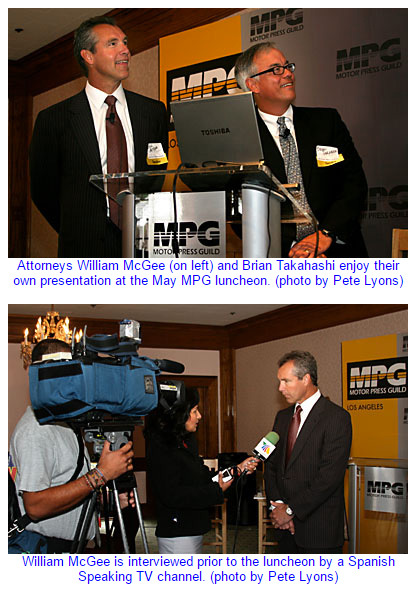 Attorneys William McGee (on left) and Brian Takahashi enjoy their own presentation at the May MPG luncheon. (photo by Pete Lyons) William McGee is interviewed prior to the luncheon by a Spanish Speaking TV channel. (photo by Pete Lyons) William R. McGee chosen to speak on California’s Lemon Law by attorney Manny Medrano of television station KTLA 5 for a special news segment focusing on consumers automobile warranty rights. William R. McGee chosen to speak on California’s Lemon Law by attorney Manny Medrano of television station KTLA 5 for a special news segment focusing on consumers automobile warranty rights. In the wake of the recent massive Toyota recalls, Manny Medrano, consumer attorney for television station KTLA 5 in Los Angeles, interviewed plaintiff’s attorney William R. McGee, who specializes in the California “lemon law”. The interview was conducted at the law firms Glendale office. Mr. McGee has represented over 19,000 California consumers in “lemon law” cases, and has specialized in lemon law for over 30 years, with 4 statewide office locations. The focus of the interview was not the Toyota recall, but rather to California consumer’s rights and how the California’s lemon law may apply to them. Mr. Medrano first interviewed a client of Mr. McGee who had recently concluded a lemon law case that yielded a buyback (repurchase) of the client’s defective Chevrolet Cobalt by General Motors. Mr. Medrano then interviewed William R. McGee, fielding questions about California’s lemon law, how it works, and what consumers should be aware of in utilizing this important consumer protection law. The highlight of the interview was that consumers were introduced by Mr. McGee to the importance of properly documenting warranty repair visits by virtue of obtaining “repair orders” from the dealership when the vehicle is presented for repairs. Also covered in the story was the point that if consumers have had repeated repairs for the same problem during warranty, and their vehicle has just recently left the factory warranty, that the consumer may still be a candidate for a lemon law claim if the problems still persist.